The first of November we made our long postponed trip to German Village in Columbus, Ohio. I say long postponed because we cancelled out the first time in favor of a week-long stay at the Balli Farm near Holly River State Park which I will post later. We then rescheduled it, but then canceled again when a second opportunity came up to go to the Balli Farm. However, just as we were gearing up for a week in the wild that cratered and so we reverted to our original plan to visit German Village. Once we decided to go to German Village and we made reservations at a motel on the edge of German Village just off High Street and began planning our activities during our stay. Columbus, Ohio holds a special place in our hearts because that is where we met almost forty years ago while graduate students at The Ohio State University. Our first encounter was when we had Population Ecology class together winter quarter, but we didn’t start dating until later near the end of summer. So of course our visit back to our “old stomping grounds” had to include a visit to the campus area to see if we recognized anything and then look at a couple of places we lived after we were married. 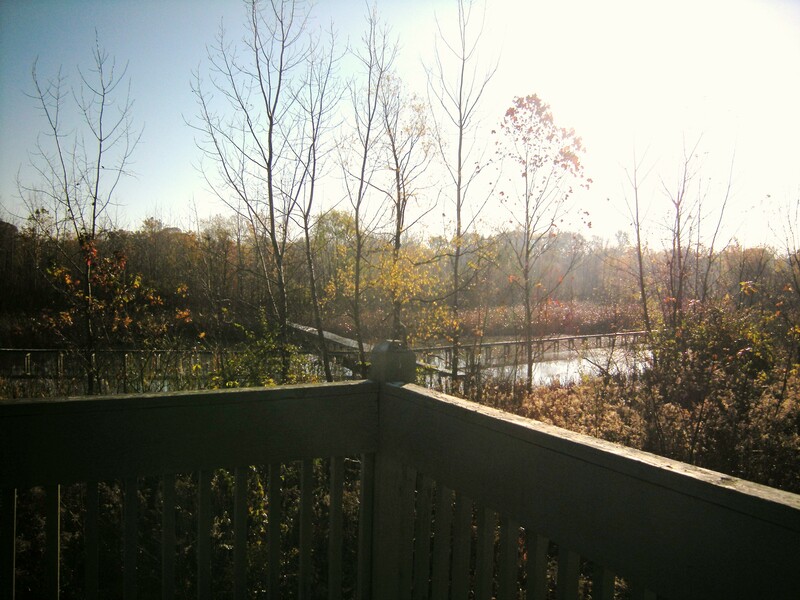 A new site that was of interest to both of us was the Experimental Wetland site along the Olentangy River since the places we lived were along the Olentangy River. The Wetland site is located across the river from our first apartment building. We toured the university wetland research area first where we went up to an elevated observation site looking out over several boardwalk areas that permits students to conduct research. They seemed narrow from a distance, but once inside the building where students carry out laboratory work related to their research there were big pictures showing classes of 25-30 students out there with professors leading field trips. I’m hoping the next picture will show, but the morning light made getting good pictures difficult. After visiting the wetland we drove to our old apartment building nearest the wetland. More apartment buildings had been built in the area so that our old building wasn’t as easily found…but it looked pretty much the same and all the newer buildings looked exactly the same as the older ones. From there we went to the first townhouse we rented later once my husband had a full time position with the Ohio Division of Wildlife while he wrote his dissertation. While this place had not increased in size we discovered it looked much different. The back patio areas had been completely fenced in with a tall chain link fence and the patios were now concrete instead of brick so there was no longer any place along the edges to grow plants. An old footpath down to the bottomland forest along the river had been replaced by wide stone steps that went down to a nice wide paved biking/hiking trail. 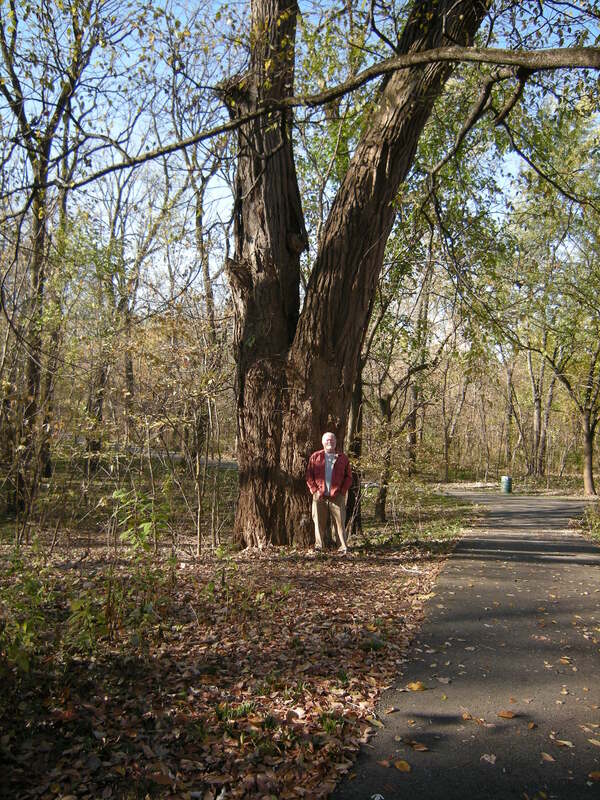 Below is a picture of Don on the tail standing by a huge old cottonwood tree along the trail. We noticed the building steps to the upper townhouses and the railings and other trim around the building had been painted a light color compared to the dark brown they were when we lived there. We went down to the lower level to look more closely at our old apartment and met one of the current tenants who told us that she now paid almost five times more rent than we did plus a fee to own a pet. When we lived there we did not have to pay extra for pets. We noticed many other changes in the surrounding area and remembered some of the past as we looked over where an old man everyone called Whitey grew various vegetables which he sold to the people who lived nearby. In addition to vegetables he also grew an astonishing variety of dahlias of different heights and colors. The most miraculous part of Whitey’s gardening was that he suffered from Parkinson’s disease and he did much of the planting, harvesting and digging on his hands and knees. Every spring he could be seen digging and planting and of course in the fall he carefully dug out all the dahlias because they were not winter hardy and stored them in a protected place. Since he sold most of his vegetables by the pound he struggled to put them up on the scales in his little shed near the garden as we patiently waited for him to tell us how much we owed him. Whitey’s old house was still there, but now the garden is all grass and his old shed is gone. It’s always sad to see how some things change, but just as often the changes are an improvement and teaches us that things are not static. After lunch we went back to our motel and later we walked to Jurgen’s a bakery and restaurant for dinner. On the way we passed some really neat gardens around the quaint houses that make up German Village. One that really caught our attention was a corner house where many Mandevilla plants, hibiscus and other flowering herbs and plants were interlaced with huge bush size coleus with variegated leaves of many colors and papyrus grasses were growing. 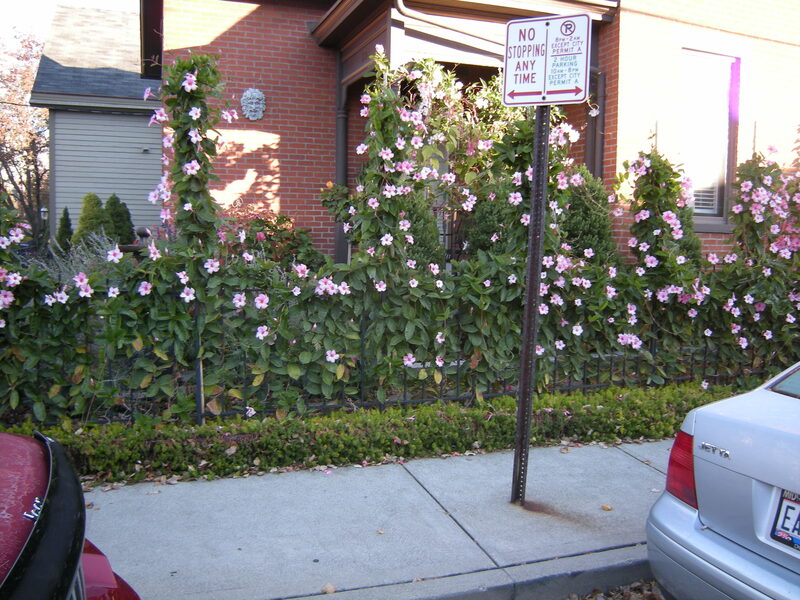 The picture below shows a few of the mandevilla plants along one side of the house. All available space seemed to be covered with plantings and all of them were flourishing. After enjoying wonderful German goulash soup at Jurgen’s we strolled around looking at more gardens. Along the way we met the owner of the house with all the many plants and he told us that none of the planting were winter hardy and that every year he removed all of the plants. He usually moved the hibiscus to his office where they overwintered and the rest of the plants he removed and discarded. He said we could take any plants we wanted as he was beginning the process of removing them. By the next day when we stopped over to collect a couple mandevilla plants and some papyrus he had cleared out many of the huge coleus and mandevillas along his back fenced in yard, but hadn’t yet reached the ones around the outside and on the tree lawn. I was happy I had thought earlier to take some little coleus clippings to root once I was back home. The next day we shopped around the area, visiting the bookstore and a few other shops that remain in the area. Then we prepared to meet some friends at Schmidt’s sausage house where we enjoyed a nice German dinner and caught up on what’s been happening in each others lives since our last visit with them. The next morning we packed up all our things along with the plants and headed home. As a child I felt lucky to be the “chosen” to help with the family garden. Of course that was just my interpretation of events and perhaps my siblings felt relief when they didn’t have to participate. I don’t really know why my Father ask me, but I do know we had a special bond and it was related to the times when we did things such as gardening, fishing or hunting. Sometimes one of my siblings would go along, but I think I enjoyed these events more than they did. I guess it might be time to discuss such things with them. But I digress, my Father used to require my assistance in the planting and tending the garden — it started when we had a garden in our own back yard. This to me, was a pretty large garden and I believe even with my adult mind, it was pretty big. The time that really made a huge difference in my life was when my Father gave me my own row in our garden to plant. He had purchased a packet of mixed seeds from Henry Fields catalog just for me. I carefully planted the seeds and eagerly awaited their germination. Of course this was after I had carefully planted various things for him, so even at my young age I could identify some of the seeds. My dad was an extremely precise and particular gardener. I remember once he gave me a stick the exact distance he wanted me to place seeds in the furrow he prepared for them. I was to use the stick as I planted the seeds so that I could make them equidistant. Now you have an idea of what he expected from anyone who helped in the garden. Sometimes he requested that 2 or 3 seeds be planted in the same “hill.” I was one of those kids who wanted to please him, so naturally I carefully did what he ask. But the first time I planted my mixed seeds I think I didn’t plant them as carefully as my Father required me to plant his seeds so I was dismayed at the results. The next year I tried to space them more carefully hoping I would have better success. It was always exciting to watch the plants grow and even more thrilling to harvest my very own produce. After a few years we stopped planting the garden behind our house and allowed grass to grow so we children would have more space for playing in the backyard. From that time on we planted a big garden out where my father’s parents lived since they had a few acres with their house on the edge of town. One of the only times I remember all of us working together in the garden was when we dug out the potatoes. As I recall my Father would plow out the potatoes and most of my family and my grandparents helped gather and sort out the potatoes. When they were plowed out, some would get nicked by the plow and so those potatoes needed to be separated out and used relatively soon since they would spoil. I’m certain those potatoes were divided between my family and my grandparents. The rest of the potatoes were put in baskets and taken to the barn where they were spread out on the floor to harden them off. After that we took them home to our house and placed them in aerated wooden bins that my father built for them. The bins were stacked in the back of a block cellar constructed off the side of the garage which was just a few steps out the back door. The back door was off the kitchen making it convenient to go to the cellar where we stored canned foods that my Mother, my sister and I put up throughout the gardening season as well as frozen vegetables that my parents liked preserved that way. I have now explained my early gardening years oh so long ago. That led me to love growing things which expanded over the years to include not only edible things, but also many flowers, herbs, gourds, mushrooms, etc. In addition to the addiction to gardening where ever I have lived over the years I also developed a love of foraging wild foods and cooking whatever I was able to not only grow but also whatever I might forage in the wild as well as what I might find at the supermarket or farmer’s market that would be a new dining experience. I plan to follow this post up with some of the many experiences I’ve had involving my passions about gardening, foraging and cooking. As you may have read the latest culinary obsession is foraging. That means more people are getting into the hobby of looking for foods in the wild. Now this is how humanity began as far as I’m concerned. It was only after industrial foods were made available that people began buying their foods and eating out more instead of foraging or growing their own foods. Prior to that people hunted, foraged and grew most of their foods. What they couldn’t obtain on their own, they bartered for from their neighbors. Over time people became specialized and communities developed where everyone relied on certain individuals for particular items. That way they could devote their talents to the few things which they could trade for most everything else. But as I said eventually people began doing other types of work and needed an easy less time consuming way to obtain food. With the advent of industrial foods, fast foods and big supermarkets the art of foraging or growing one’s own food began to be lost. As with everything over time people began to rediscover this lost ability and we see the evolution of this latest obsession of foraging. Now there have always been those who never gave up the love of hunting and fishing or foraging for certain wild foods that are traditional to certain regions of the country. Examples would be mushrooms hunting throughout the United States or the local interest in ramp foraging in spring in the regions where they are found. So all foraging did not disappear entirely, but just decreased in popularity. But there has been a history of people who have continued to forage and keep the old ways alive. Now as with everything in this circle of life foraging has become the latest obsession. Thanks to those of us who kept it alive, we have a new generation to teach its values. I think that is a part of the eat locally and instead of farm to table, it’s now from the land to the table cuisine. Luckily I never stopped doing this and so find this new obsession to be a continuance of my usual lifestyle. My wild foods knowledge began as a child when my parents introduced me to not only wild foods, but also to gardening and all the processes involved in storing foods to enjoy throughout the year. No matter how much I thought I didn’t enjoy working in the garden and putting up the harvest, I discovered in my mature years that I wanted to reclaim those times and go back to them. I wonder if it was my attempt to capture some of the lost souls I miss, or if I really wanted to feel what my relatives felt as they put away food for the year. I think it was the feeling of satisfaction that I got from putting food up for lean times that was really the reason since I knew where it came from and how it was processed. I guess that means I knew pretty much what it contained and that along with the fact that it didn’t have all those ingredients that I couldn’t pronounce or any extra added preservatives and dyes, I felt it was healthier for me and my family. So gardening and foraging that I learned or at least heard about from my family stuck with me. My first memory of wild foods seems to begin with my mother and grandmother who harvested greens to cook in the spring. The second most vivid memory is of my father and grandfather who hunted squirrels and rabbits for food as well as fished. Those two connections seemed to have been locked in my genes along with all the memories of the gardens we had at my grandparent’s home. As a family we all planted, harvested and shared the bounty of our gardens as well as the wild provender that was procured. They also collected wild berries and nuts that were made into wonderful desserts. So my early beginnings set the template for my adult life. It seems no matter how far I get from those early beginnings that I still go back to them. Although I’ve tasted cuisines from around the world and actually liked most of them, I still go back to my roots and when I cook a meal, while it may take on an exotic form, it is often many of the basic foods from my past — just prepared in a new way. But it also may be a new food cooked in an exotic way that hones my culinary skills since I love new taste experiences. When I got older and went away to school, I found that I was continuously rediscovering the joys of gardening and foraging. As a student supplementing my food supply through foraging and gardening provided a wider cheaper selection of food. Over time I grew more and more interested in trying wild foods that I had never had before. As I said earlier my father provided rabbits and squirrels for our table, but deer and turkeys were not very common so I never had any venison or wild turkey until I was in my twenties or older. And in my college days I tasted my first pheasant and wild ducks and geese as well as frogs, crayfish, turtle and many fish that I’d never eaten before. When I lived on the Atlantic coast I discovered more and more seafood and every time I traveled I tried the local foods learning that I liked just about anything I tried. While most of this refers to wild seafood and meats, I have also discovered many new plant foods too. In addition to that I continue to try to grow some of my foods and most of my herbs that I use fresh as long as they are available and then dry for winter use. I’m always adding new herbs to dishes to improve their flavors and give my palate new taste sensations. So while foraging might be the latest obsession, it is something that has been a part of my life since I was born. I have tried to pass this interest on to my family and friends. In the process I have found hunters who love to hunt, but cannot eat all they get. I discovered that some of the time it’s because they or their families don’t know how or want to prepare it. They help me my providing the excess meat and I in turn try to prepare some for them in return. In addition I have found fishermen who are willing to share their bounty with me too. So I can enjoy more wild foods in this manner. I have discovered many wild plants that my family did not eat and learned how to prepare them. In future blogs I will discuss some of my favorite wild food recipes for both wild meats and plants. 2. Divide dough into 4 parts. Take one part and roll into a long, 1-inch diameter log. Cut gnocchi into 1-inch pieces. 3. Heat skillet over medium-high heat. Add butter and olive oil. when butter is just lightly browned, add gnocchi in single layer. Fry on one side for 2 minutes, flip. Fry other side for 1-2 minutes. Timing really depends on how big/thick your gnocchi is. Do a taste test: do you taste flour? Not done yet. Serve with a sprinkling of lemon zest, parmesan and parsley. I live on a mountainside in a narrow hollow and we don’t receive enough sunlight nor have the right space to grow a real garden. However, I love gardening and keep trying to grow something. Last year I tried zucchini and all it did was flower. So I started eating the flowers since I apparently was failing at growing even zucchini. 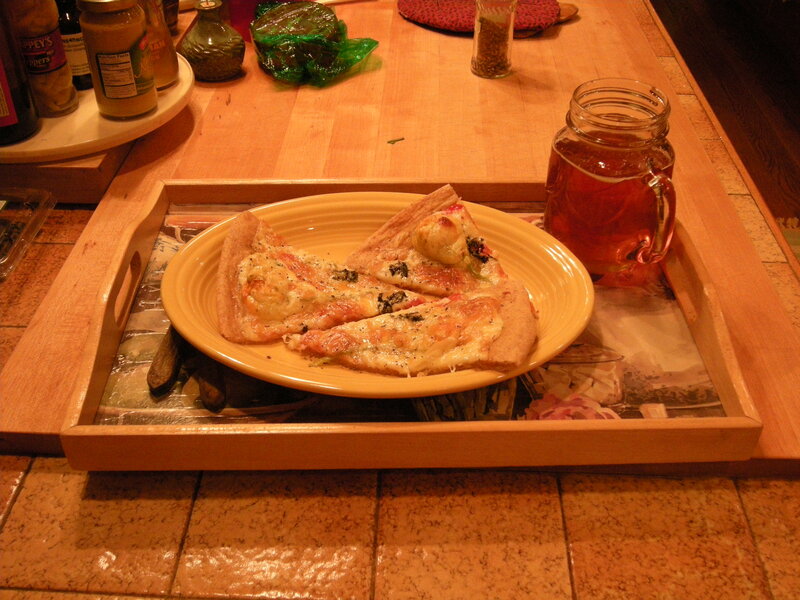 I would mix up some various cheeses which always included ricotta cheese and whatever else I had in the fridge. I would chop up herbs — I seem to succeed at growing most herbs. Then I stuff the blossoms with this mixture of cheeses and herbs and fold the petals over the top to close them. I have been frying some sage leaves in butter until the butter starts to brown and then laying the stuffed blossoms in to brown lightly. I turn them a couple of times so they are browned as evenly as possible. 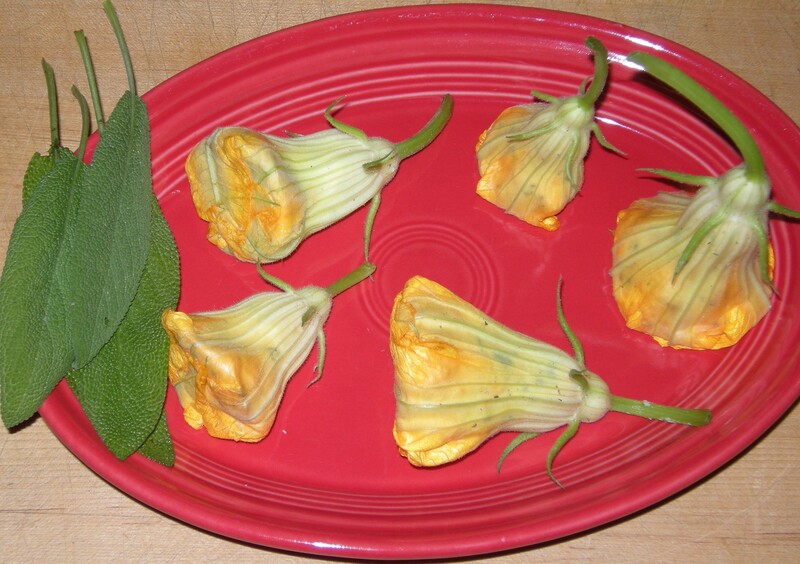 See picture below of stuffed blossoms. Little wrens are doing well, but it seems impossible to get a picture as the plant gets in the way of getting a clear shot. Today the mommy cat that was Whitey’s friend came for breakfast. I haven’t been putting food out so I hurriedly put out a plate of food and called her. Surprisingly she came running back and meowed. I told her to come on up and eat and she did with me standing there. I decided to pet her and she allowed that too. Now I think we are friends — that’s a big step given that she used to be so afraid that she’d run if she spotted us looking out the window and not come back for a day. Anyway we’re making progress and I hope if she did have kittens with Whitey, that one of these days I’ll discover a white kitten resembling Whitey. So much has happened since my last blog with promises to update you on several things. So I begin, hoping to remember everything. 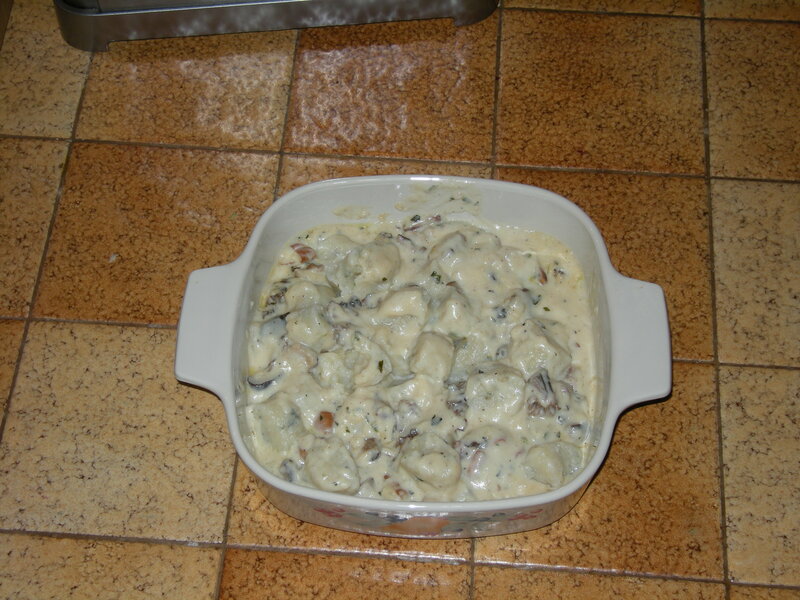 First we had the wildfoods and I took two kinds of gnocchi as I explained earlier. They were very good, but didn’t go over very well. I think many folks didn’t know what they were and there was so much food that they passed them over. However, those who did try them said they were good. The top photo is the lemon gnocchi that I pan fried in brown sage butter and the bottom photo is the instant potato ones that were boiled and served in a mixed wild mushrooms sauce. I must admit I thought the instant potato ones weren’t going to come together at first. I had to add a little more water and cover them with a bowl and let them sit a few minutes so they would form a dough that I could work with. Otherwise they were falling apart. Now as for the wren nest, I noticed one baby had hatched yesterday morning, then later another and today all four eggs have hatched. Now the mother is being very attentive feeding the hungry mouths and trying to keep them cool when it gets really hot. Also we monitored the bluebird boxes again this past week. Out of approximately 12 boxes, one had baby bluebird hatchlings. One had wrens and a couple others had either wren nests or swallow nests. We removed the inactive nests. 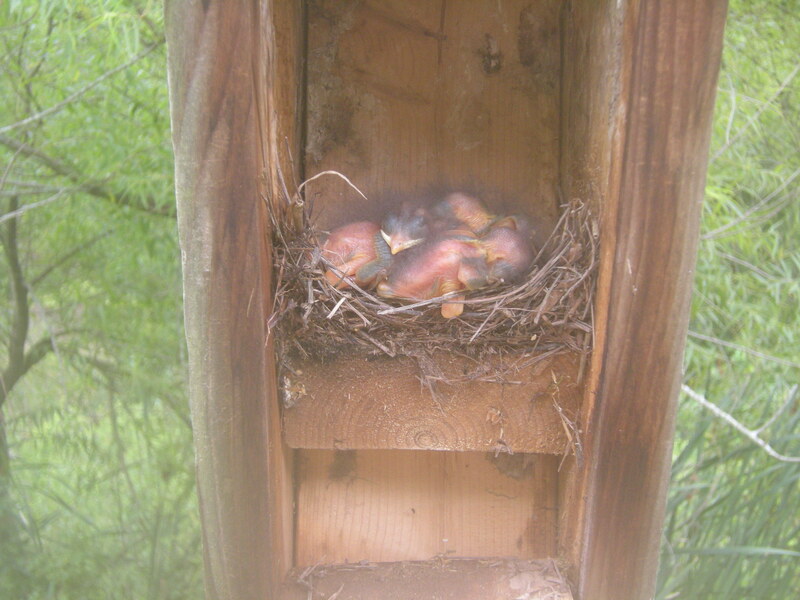 I took a picture of the baby bluebirds which is below. I will try to get a picture of the baby wrens and post it another day. Finally I canned tomatoes, then peaches and made some dill pickles and bread and butter pickles. I’ll try to post a picture of them too. Now all I want to can is some roma tomatoes which will probably be on next weeks agenda. One final note on my stray cat Whitey — a neighbor called to say that he talked to another neighbor who said when she saw the dead cat on the road that she felt so bad she stopped and picked him up. Later that day her son and she buried him in their backyard. That made me feel better knowing that he was buried and not swirling down the waterway from the flood. I remember one time we were having our monthly wildfoods meeting and we were thinking Scandinavian lutefisk and I decided to try my luck at making it. My previous experience with it was that it seemed an awful lot like wallpaper paste. But not to be discouraged I looked up a recipe and found that it is often served with a flat tortilla like potato bread known as lefse. Since my plan was pretty much last minute, I looked and looked until I found what seemed like a simple easy lefse recipe that used potato flakes rather than real potatoes. That seemed good to me since I didn’t want to take the time involved in cooking and ricing potatoes for this sudden addition to my lutefisk. I made up the lefse and then our meeting was postponed. So into the freezer went my lefse for the next month. I pulled them out and put them in a tortilla warmer and off I went to the wildfoods luncheon. I made the lutefisk there while I heated the lefse in a microwave oven. I want to report that not only was the lutefisk good, but that the lefse was a real hit that added the finishing touch. For anyone unfamiliar with lutefisk, it means literally lye fish and it is fish that has been salted and dried often using lye. It is sold in frozen packages which must be thawed and soaked in several changes of water to remove the salt and lye. It is then boiled wrapped in cheesecloth so that the gelatinous fish doesn’t fall apart. Once it is cooked it is salted and peppered and served with warmed buttered lefse. I think when I made the lefse that I made only about one fourth of the recipe and I made smaller tortillas than described here. Mix well, make into long roll. Cut into 4 dozen pieces. Refrigerate in single layers on cookie sheet between waxed paper, layers which have been sprayed with vegetable spray. Refrigerate overnight or until thoroughly chilled. Roll out as piecrust into dinner plate size pieces. Keep pieces of lefse dough refrigerated until ready to roll them out. Roll out and llift from pastry board to griddle and turn to brown both sides lightly. Stack sheets together and cover with a towel until baking is finished to prevent drying out. Brush with butter and cool, then they may be stacked and stored in zip lock bags. If sheets have dried, add a dampened piece of towel to zip lock bag, placing it flat over the sheets of lefse before freezing or storing. Thaw and warm in microwave oven in tortilla warmer to serve. Wildfoods luncheon is coming up Monday again and I’ve been thinking about making gnocchi. Tonight I’ll make some pan fried lemon ricotta gnocchi with a brown sage butter sauce. I hope that will go together all right. My next experiment will be to make an herb cheese gnocchi with idaho potato flakes and a mushroom sauce to take to our wildfoods luncheon Monday. The other day we went looking for golden chanterelle mushrooms. I found only two; but I recently soaked some of my shiitake logs and they are bearing. Now my plan is to make a chanterelle/shiitake sauce for some homemade gnocchi. 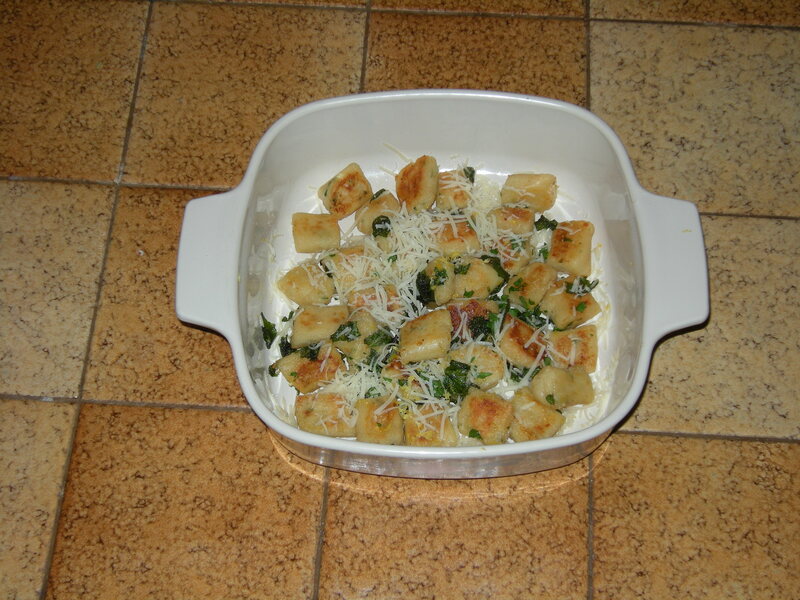 I have a pretty good feeling about this gnocchi recipe although I’ve never tried it. Usually gnocchi is made with potatoes, but this recipe uses potato flakes. Remembering how good the lefse was made with potato flakes makes me want to try this version again by passing the cooking and ricing of the potatoes. I’ll let you know how that comes out later and add my gnocchi recipes and sauce after we try them out. Don is taking a muskrat stew to the wildfood luncheon. It’s rather amazing that my friend in Delaware picked up the muskrats in southern DE and then he delivered them to another friend in northern DE and she put them in our daughter’s freezer so that we were able to pick them up when we visited her. After that long trek across the mid-Atlantic they were made into a special stew and now it will be transported north to share with our wildfoods group.